THE LATEST innovation in large-format vertical gel electrophoresis from Cleaver Scientific, the VS20 Wave, promises to improve productivity in the lab thanks to its ergonomic design. Where some competing systems may require the adjustment of up to 24 separate screws to secure their two glass plates, the VS20 Wave uses just four screws to hold four 20x20cm gels. Cleaver says this vertical screw-clamp arrangement ensures faster set-up, and also exerts uniform pressure along the height of the glass plates to create a leak-free seal without gel compression. 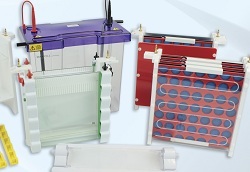 The system is designed to perform a variety of separations, including both first and second dimension SDS-Page, capillary tube gel IEF, and electroblotting. The design of the Page insert aids handling and set-up, says the company, while the inner buffer chamber allows set-up to be completed without the inclusion of a top tank or upper buffer chamber. A detachable cooling coil enables the Wave to be connected to a recirculating chiller for uniform, trouble-free electrophoresis, as well as permitting a higher voltage to be applied to give faster runs.